So, despite my naïve protests about being a shooter not a hunter, I was dragged into the world of tactical hunting. A pile of dead hogs later, I was hooked. I no longer own any of the gear I used that day. I’ve gone through many iterations and changes in my kit. 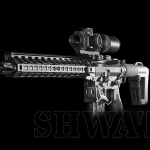 Thanks in part to my role here at SHWAT.com I’ve had opportunities to try all kinds of configurations for hog hunting guns. So when I was recently asked about how to set up an AR-15 for Hog Hunting, I readily agreed to answer here. While I’ll be the first to say that there’s no one size that fits all, when you’ve finished reading I think you’ll have a better idea of how to set up your own AR-15 for some tactical hog hunting. Then it’s time to chase some wild boar! Why focus specifically on setting up the AR-15 for hog hunting? It’s this generation’s gun, and for good reason. The limitless configurations make it one of the most versatile guns on earth. The hardest part is figuring out what you want, never mind need, as you customize your AR-15. Since you’re reading this, you’re more likely to own an AR-15 than any other single gun. Here are some questions and answers for you to consider when getting set up to hunt wild hogs with yours. Perhaps your first consideration is caliber. I don’t know how many different calibers an AR-15 can be built in. Hogs are hunted with a lot of them including .223/5.56, 300 Blackout, .458 SOCOM, 6.5 Grendel, 6.8 SPC II, and countless others. I’ve killed hogs with most of those and others as well. 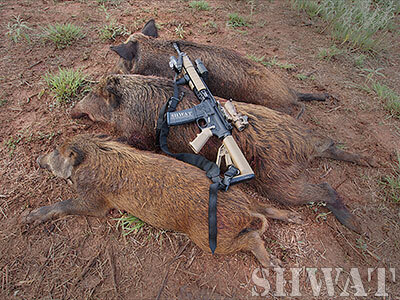 This will surprise some, but not everyone: I’ve killed more wild pigs with .223 than any other caliber. Modern loads render some of the old conventional wisdom obsolete. Remington Hog Hammer made with Barnes 62 grain TSX bullets has demonstrated excellent performance for SHWAT™ writer Brian McCombie, and I’ve had great experience with DRT Ammo’s .223 on hogs weighing 200+ pounds. A lot of buzz over 300 Blackout during the past couple of years has lead many to explore that round. I’ve been cautious about getting too wrapped up in it, but I plan to give it a workout this year. Having hunted with sub sonic rounds through a short barreled AR pistol with Liberty Suppressors Mystic X silencer, I wasn’t impressed. Maybe it was the ammo; maybe the distance was too great. It was definitely quiet. We’ll try it again with some unique ammo, but super sonic 300 Blackout looks more promising. But like .458 SOCOM and 6.8 SPC II, your range is a bit more limited. If you’re hunting under 200 yards, any of these rounds should be great. If you’re planning longer range hog hunting, the 6.5 Grendel might just be your pick. Night hunting hogs is a real blast. Adding a white light to your gun is easy and doesn’t have to cost a fortune. If the shooting gets fast as the daylight fades to dark, your white light becomes a real asset. I’ve watched Bill Wilson of Wilson Combat point a white light at hogs who were undeterred by its presence. Bill has spent countless hours with the hogs figuring out which white lights scare them, and the specifics of color temperature and technique that leave hogs comfortable and vulnerable. Most hunters effectively bagging hogs in the dark have instead employed a broad variety of weapon mounted green and red lights, particularly when hunting predictable places like feeders. Alternatively, you can also equip a feeder with remote control lights like the Inhawgnito, but that’s another story. Flashlights in white, green and red are all easy add-ons to your AR build that won’t trash your bottom line. An important side note: you’ll want your AR to use a hand guard that allows for mounting accessories. Three or four years ago that generally meant a quad picatinny rail. Today you have countless options. But there are better, albeit far more expensive, doors to crash. Jump into the high tech world of night vision and thermal optics and you’re into a whole new level of the game. Instead of spending a hundred dollars for a light, you’ll spend ten to twenty times that to access what many consider to be the pinnacle of tactical hunting. Case in point: Recently I’ve been highly impressed by the line of thermal optics from IR Defense. I’ve watched IRD grow for a year, and recently hunted with their IR Hunter Mk II. Using this thermal optic, I was able to identify hogs at 400 yards and shoot them on the run at 125 yards. Thermal can fool you though. Rocks at a distance can look remarkably like a group of pigs far off. Stay tuned to SHWAT.com for more on that. 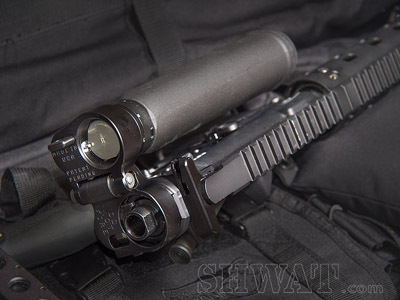 An alternative to thermal is traditional night vision (NV). We’re talking the usual green images. It’s great military technology available to us and allows for the use of infrared lasers and illuminators of countless price points and configurations. The best gear for this is almost as pricey as thermal, but has the added benefit of being able to drive and scan for hogs without any additional lighting. For as little as $3100 a number of manufacturers like TNVC are producing NV monoculars that can be mounted to your AR-15 or to a helmet. We’ll cover your NV options more thoroughly later on here at SHWAT.com. Hunting during the day is pretty straightforward. Have an optic that works for your scenario and get to work. Obviously, your scenario makes a difference along with your preference in optics. Years ago I invested in a Trijicon ACOG ECOS system that gave me a 4x magnified optic with a red dot 1x unmagnified optic combination. It remains a favorite set up. Red dot sights like the EoTech and Aimpoint optics are super fast to use with both eyes open and I’ve enjoyed great success with them as well. If you plan on bagging multiple hogs from a group, you’ll be hard pressed to beat this kind of a set up. Alternatively, more magnification both increases the ranges you can make confident shots at and adds precision to virtually any shot beyond 50 yards. There are probably as many magnified optics choices as there are ammo choices. Lots of optics are good enough to hunt hogs mid day at 150 yards. Your run of the mill 3-9x scope might be just fine. However, cheap scopes simply aren’t as sharp and lose contrast quickly at higher magnification. Lack of high quality optical coatings can leave you unable to see clearly with your scope angled towards a late afternoon or early morning sun, washing out when pointed in the direction of the sun. Brands like Trijicon, Nightforce, US Optics and Bushnell Elite Tactical are all winners at various price and feature points. If you hunt from a blind you might not need a sling on your AR-15. I prefer spot and stalk hunts which leave me carrying my rifle so I value a sling. Single point slings are often preferred by tactical shooters, but for walking any significant distance, I prefer the stability of a good two point sling over an AR bouncing around on a single point sling. Over time I’ve collected a number of slings including convertible single/dual point models, but my go-to sling, a Viking Tactics two point padded model, remains my favorite. If precision is important to your hunting, you need an upgraded trigger. Truth is, once you’ve used a good drop in trigger replacement you’ll probably loath whatever trigger came in your rifle. 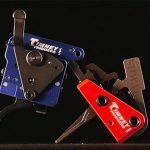 I’ve pulled Timney, Wilson Combat, CMC flat triggers and plenty of others. It seems like there’s a new drop in trigger maker for the AR-15 popping up every other month. Most are pretty good; some have nice proven track records if that’s important to you. While there’s no limit on interchangeable AR-15 configurations, these considerations combined with your personal preferences of brand, grips, stocks, etc. will get you all set to hog hunt with your AR-15. Fact is, getting set up to hunt hogs with the puzzle pieces covered here will also get you set up to effectively hunt various varmints, deer and other exciting prospects for the tactical hunter. Want to show off your favorite setup? Tag @SHWATteam on Instagram and Twitter. 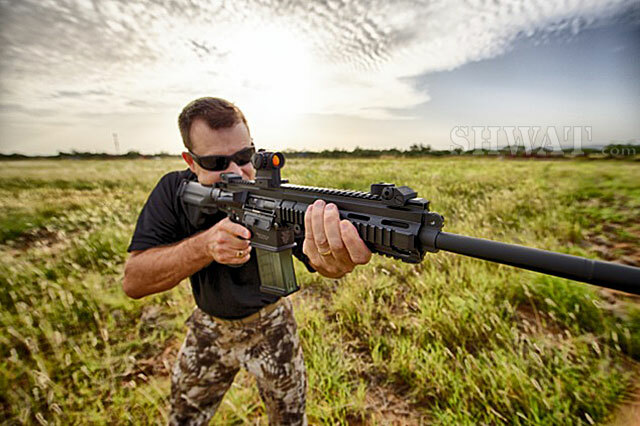 This entry was posted in Special Hunting Weapons & Tactics™ - The Center of Gravity for Tactical and Long Range Hunting and tagged AR-15, AR15, Gear, How To, Hunting, wild hog hunting by Jonathan Owen. Bookmark the permalink.